Note: The following article originally ran in the pages of Masonic Magazine as an editorial. I am posting it for those not familiar with it, as it is referred to in the previous article, There’s a hole in our bucket. So there is this restaurant chain with locations throughout North America. Its slogan is a pretty catchy one and the chain’s management uses it on a daily basis to motivate staff and to recruit new patrons to the chain’s thousands of locations. The slogan is “we take good food and make it better” – eight simple words, which have struck an emotional chord with millions of people who like to eat. There is no marketing genius behind the slogan or the success of the same in attracting people to the restaurant chain. Everyone likes good food, so it is unlikely that there is a person alive who would not like good food made better. Who could resist such a slogan? 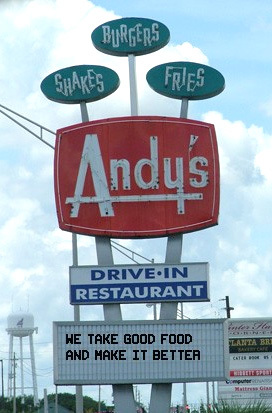 Sadly, the restaurant chain seldom lives up to its own slogan. The restaurants are often poorly decorated – their tables and chairs wobbly and in need of repair. Staff often quarrel with one another and the management, too often, seem only to be concerned with climbing the corporate ladder to the head office. The food, so much talked about is bland at best and dreadful at worst. Yet as each new patron comes in for the first time to sample this “good food made better” he sees a group of smiling faces, all lapping up the meal as if it was the greatest food on the planet – just like the advertising people said it was. The new patron does his best to eat his meal even though the food offered does not appeal to the palate as sweetly as the words used to describe it. Not wishing to show his displeasure to his two friends who sponsored him – for it is, after all, an exclusive restaurant – he sits in silence eating his meal with each mouth full being as forced as the smile on his face. Sometimes the patron simply pays his tab, leaves the restaurant and vows never to return to the establishment. However, sometimes the patron decides that maybe he just went on a bad night – perhaps the staff was having a bad day because the regular cook was away. Perhaps those people enjoying the meal were just being kind and did not want to offend the new cook. He decides to give the “good food made better” joint one more try. Returning on another night he sees the same dozen patrons who were there the month previous – they are still arguing with one another about which fork you should use for the salad and the proper way to hold a wine glass. The manager is still ignoring the new customers in favor of the company higher-ups seated at a back table who he is trying to convince of his suitability for a more prominent position in the firm. What’s worse – the food is still bland, boring and not what the sign on the door proclaims – yet the regulars are still lapping it up like it’s their last meal. This time the patron decides that the marketing slogan is nothing more than eight simple words cleverly arranged to deprive him of his hard earned money. So instead of voicing his concerns, exercising the old business axiom that the customer is always right, he says nothing. Instead he leaves the restaurant and vows never to return – either canceling his pre-booked reservations on the way out the door or never returning and having his membership cancelled by the chain via a nasty letter. He wonders how it is that the restaurant survives and why the same dozen diners seem to enjoy the food so much. His conclusion is a simple one – they like things the way they are and the establishment will never change so long as the chain is run by people who like to make bland food and patronized by people who like to eat the same. And so we come to a problem that is rife within Freemasonry today. We advertise ourselves as an organization that makes good men better, and while that is precisely what we have done for millions of men over the centuries, it cannot be argued that we are letting down the many young men who enter our doors who feel cheated and deceived. “I really feel that I have been sold a pack of lies,” wrote one such young mason recently on an Internet discussion forum. How sad it is that a young man, who has been a Mason for one year would feel that he has been lied to by an organization that has Truth as one of its three greatest attributes. “This is not the Masonry I signed up for,” he continued in his posting and in so stating arrives at the crux of our problem. Freemasonry in large parts of the United States and Canada is not offering what it is advertising, but if it advertised what it offered – would it receive many new candidates. It just does not have the same marketing strength as “Freemasonry – we take good men and make them better”. Unfortunately our young brethren, past and present have tried to improve what Freemasonry offers within the tiled recesses of our lodges, but are met with resistance at each step of the way. We say we are about making good men better through self improvement – yet few are the lodges who apply the working tools within the body of a lodge to educate our young members as to how to do this. The Masonic Information Center (MIC) recently released a publication entitled, It’s About Time. The publication identifies the problems currently confronting Masonic identity and offers sound solutions for the same. However, we have allowed, as the MIC points out in the publication, Masonry to be shaped by the 20th century’s emphasis on the Masonic ritual being the completion of the Mason’s education about his fraternity. Like the analogy of the restaurant chain, little changes in how lodges deliver Masonic lessons because the same dozen patrons sit in her seats and run the show. Those men, like the restaurant patrons in our analogy, come back month after month and year after year because they enjoy the bland food – a meal that is largely comprised of recitation of minutes, tedious debates over how funds are dispersed and arguments over when and how to salute the Worshipful Master. And when a young man, initiated, passed and raised leaves because he finds the meal unappetizing, he is viewed as a disgruntled customer, which the restaurant is better off without. The recipe of Freemasonry is as sound today as it was three hundred years ago – it is the present kitchen of stubborn cooks who need to be tossed out. Closing Note: Before anyone starts yammering about joining a good lodge, let me assure you I have done precisely that. This article is meant to convey the message of why things seldom change. It is not a commentary on my own present situation in lodge. Amen. I am so sick and tired of hearing “We never did it that way before”. If we did, I would not be up in the lodge meeting, suggesting changes. My lodge does not even have a website! Joke: How many masons does it take to change a light bulb? Answer: None. Masons do not believe in change. I would just once, like to see Freemasons out in the public, doing what I’ve always thought we were supposed to do, help people. Instead, I see the same thing, over and over. A bunch of guys, standing around discussing how wonderful it is to be a Freemason and blow gutting as to how much integrity they all have. Ive seen masons walk out of the lodge, right past a homeless man, who is freezing and never so much as even acknowledge his existence. I’d like to see that change.